Palmetto Dunes 5* Home. 10% Discount off Final three remaining summer weeks !!!! House, 4 Bedrooms, 4.5 Baths, Sleeps 11. Walk to Beach, Golf, Tennis, and more!! 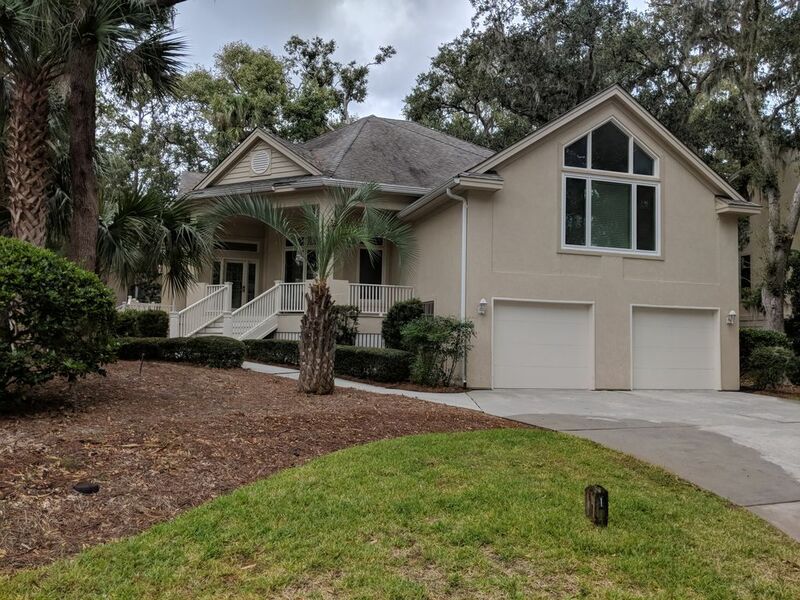 A beautifully modern 4th row luxury home built on a quiet wooded lot in Palmetto Dunes, the #1 Family Beach Resort in the US. With a heatable pool outside and five miles of white sandy beach less than a 5 minute walk, this is the perfect vacation home. Resort amenities include world class golf, tennis, bicycling, marina, restaurants, shopping, canoeing and lagoon sportfishing all within a short walking distance. The home offers a contemporary setting with a very modern, open layout. The spacious family room, well situated and overlooking the pool, has plenty of seating and offers cable TV, DVD, fireplace, and Wifi. The two oversized master bedrooms have cable TV's and DVD's as well. Recent upgrades to the home include new tile flooring, new upstairs carpeting, accent tile, granite countertops through out, fully remodeled baths, and fresh paint.The kitchen is large and open and completely stocked with all needed cookware and utensils. There is a laundry room with full-size washer and dryer. Outside there are two decks and a large pool patio with plenty of seating and six chaises. Well situated in the community, you are less than a few minutes walk to championship golf/ tennis, restaurants, bike and canoe rentals, entertainment, fishing, and our wonderful beach. Our on-line reviews are outstanding. A 5***** star rated home, this is the place for your Hilton Head vacation. Please note that numerous upgrades have been made to the home since the original recording of the home video. Use the home video as more of a walk thru versus a depiction of actual home features. Originally from southern New Jersey, traveled to Hilton Head in late 1990's and fell in love with the island. Shortly thereafter, purchased our first property and eventually moved permanently to the island in 2008. We now call Hilton Head home. Outstanding open floor plan within a very short walking distance to the beach and championship golf. Simply cross the footbridge over the lagoon and arrive at one of the most beautiful beaches in the country. Enjoy recent modern upgrades in the main living area to include all new floor tile throughout, accent tile, new granite/ quartzite countertops, and a fresh coat of paint. Looks fantastic. Less than a 5 minute walk to the Ocean. Located in Palmetto Dunes, a Gated Resort. Recently enlarged for more lounge chair seating. Can be heated for an additional charge. seasonal rates apply. Ask for details. 3 Championship Golf Courses (Arthur Hills, Robert Trent Jones, Tom Fazio), World Class Tennis Facilities, Canoe rentals along 11 mile lagoon, Sport fishing both offshore and within the lagoon, Free inshore fishing trip or island cruise on the Owner's private boat (seasonal).